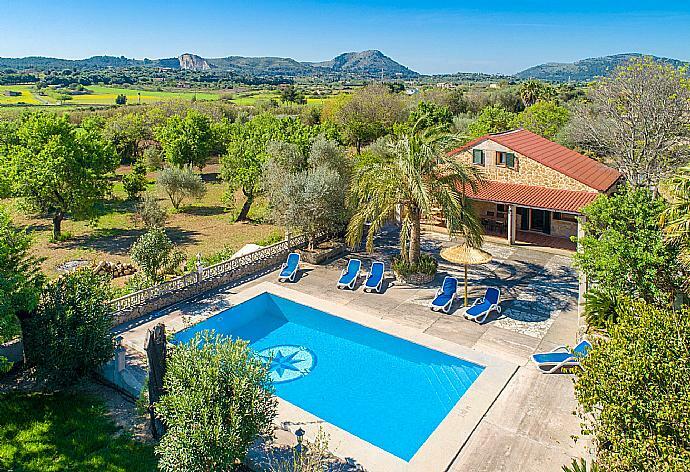 Villa Minerva is located in Alcudia on the Spanish island of Mallorca. 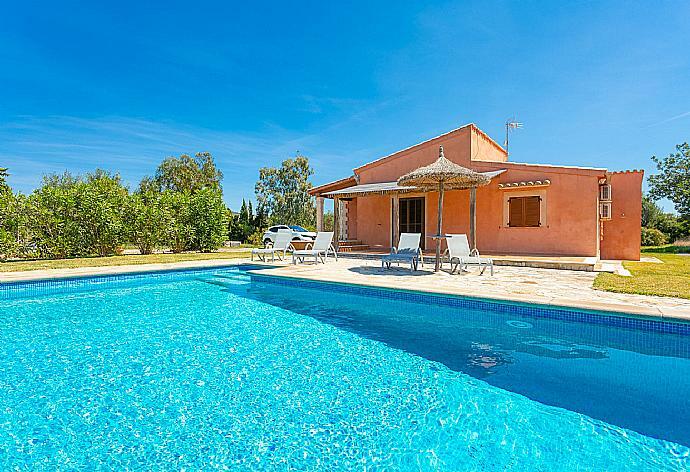 This detached vacation rental property is air-conditioned and sleeps up to 9 people (8 adults and 1 child) with 4 bedrooms, 2 bathrooms along with private swimming pool. The villa is walking distance to the beach and restaurants. The property is on one level: Large L-shaped lounge with dining area and doors opening to a shaded front dining terrace. Also contains a kitchen, 4 bedrooms, (2 with air conditioning), 1 day room with single bed, and 2 bathrooms. Pool Access: The pool has steps up and then Roman steps inside the pool.Adjacent to the pool is a large BBQ. Excellent. Great spacious accommodation in a fantastic location. Nice place, close to the see, enjoyed the time with our family, place to return to ! 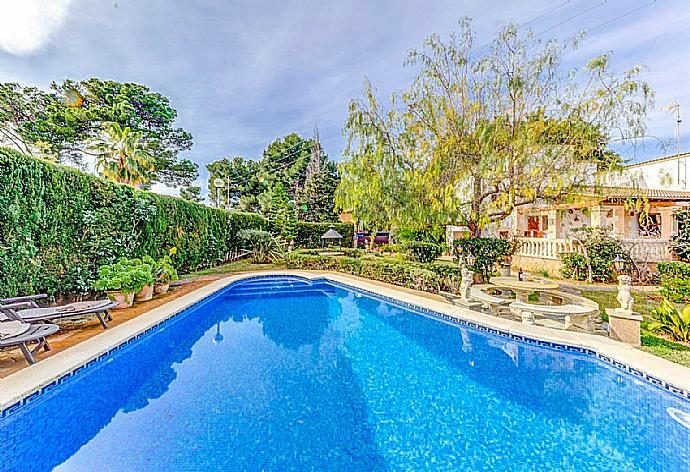 Great location close to the beach, supermarket and restaurants. Property is a little tired but overall represents good value for money. We really enjoy our holidays in Villa Minerva. Excellent location, good standard, nice outdoor area with barbeque and pool. Everything you need is within walking distance, the beach, supermarkets, nice restaurants. Ideal location, nice and quiet yet close to commercialisation. The property is bigger than it looks. The garage was big enough to store 8 bicycles, with plenty of room for bikeboxes etc. Outside area was clean, tidy and spacious. If Im honest the only thing I can fault is the size of the coffee machine, the villa would benefit from having a bigger one! Overall really pleased, will look to return. Very good. excellent access to harbourside & town & all facilities. Had a lovely holiday it was so relaxing and the central location of the villa was great. We had a great family barbecue the local supermarket was full of goodies to keep you well fed and watered. It is definitely somewhere we would return to. Excellent location, next to the white sand beach. Near shops and port. Quiet and private surrounding. Thank you very much for that great home. We had a fantastic week in Alcudia with another family. The house is even so much bigger and lovelier than it looks on the picture. I'm sure we will book it again :-) Also it was always a very nice communication with Agni-Travel and i really felt cared for. Had a great time with the family and would definitely stay here again. The maintenance service was excellent and very prompt. Our holiday Villa was fantastic. Very big and perfect for a large group (there were 6 adults in our party) with the added bonus of the pool and BBQ. The beach restaurants and shops all within a 5min walk. (Beach is less than a minute walk and is beautiful and very clean).The accommodation is really great with all the amenities washing machine (clothes line in garage) dishwasher etc. There is air-con in all the four bedrooms. Large fans are in the lounge and other areas. Maid service to collect and replace towels twice a week and bed changed once a week during a 2 week stay. Everything was clean and tidy when we arrived.This is the 1st time we have used Agni Travel and I must say weve been really impressed with the service from booking to the actual holiday. Communications have been great right from word go. Also they provide a mobile contact service that you can text anytime during your stay with any problems or information with a management company local to the villa. All in all its 5 for the accommodation and Agni Travel who I will be definitely checking out for another villa abroad next time. Just returned from a fab week at Villa Minerva very relaxing. As a group consisting of two families we shared this villa quite comfortably. The bedrooms were all air conditioned which was a godsend in the 35c heat of July. The Villa is very traditional and could do with a bit of modernising in places however this did not hinder our stay. We had a few maintenance issues during our stay but the in resort team were fantastic and arranged for a maintenance man to visit same day. Location is amazing. Beach is only a minute walk. Supermarket two minutes walk. Harbour ten minutes walk along the promenade. Shops and restaurants five minute walk. Everything about this villa was conveniently located. The pool was fabulous. It suited our children fine and being slightly raised gave us some comfort. The kids were in the pool non stop all holiday. Outdoor shower is great especially for washing sand off after the beach.The villa grounds are very secure. There are two entrances which are lockable. We locked the front and only used the gate by the pool all week. The villa is situated on a nice quiet road we had no disturbances at all. We thoroughly enjoyed our stay and are already looking into returning to Villa Minerva next year. It was a very nice holiday. Everybody enjoyed the stay. Its not just a perfect place with kids also with Seniors. My Parents Uncle and Aunt could enjoy it also. No Steps in the house :-) We really can recommend the villa and I think one time we come back. It was everything in the house what we needed.Its a short way to the beach to the harbour to the next supermarket. Everything what you need is around you. 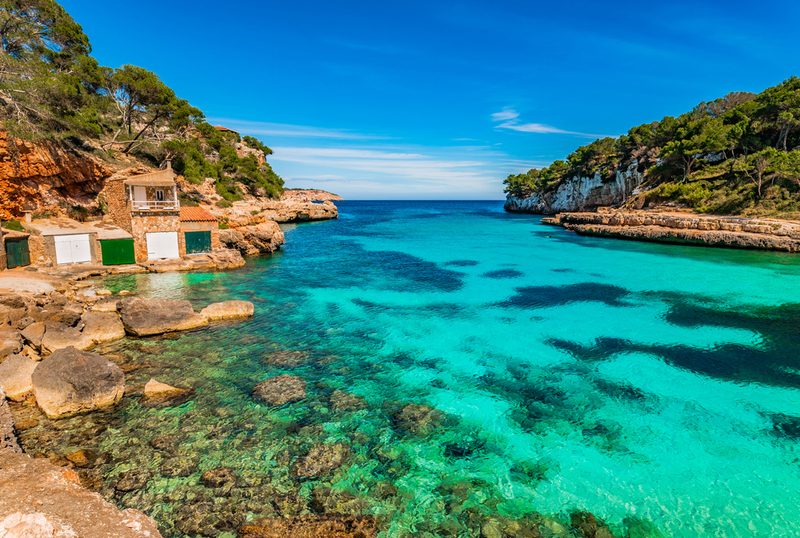 I have been in Mallorca 11 times and I will spend my next vacation also there because its a beautiful Island. Service from Agni Team was perfect Everybody was very very helpful friendly. Megan and Ana ( Local Agent) are great. We did not have any problems. The spacious accommodation at Villa Minerva was perfect for our group of five girl friends. Because of the layout we were each able to have our own sleeping area and private space with plenty of different living areas both inside and out where we could be together. The pool is not large but more than adequate especially when the beach is so close. Its an easy walk along the seafront to bars and restaurants. Old Alcudia is not far to walk either, though there are plenty of buses for those who prefer. The property is comfortable and traditional rather than ultra modern and chic but that is clear in the description and for us added to the character and made our holiday even more relaxing. A couple of small issues at the property were swiftly dealt with by the local representative and contacting them could not have been easier. Pick this property for a relaxed rather than luxurious holiday, pick this company for efficiency and good support. I would like to bring the wonderful prompt and helpful service from the local team to your attention. The small issues with the internet and an insecure curtain rail were dealt with without any fuss. Well done Petros for co-ordinating it all.From our initial enquiry through booking paying pre-holiday info and the actual holiday everyone at Agni Travel with whom we had contact was friendly and inspired confidence. I had never heard of this company before but will explore what they have to offer for future holidays. There were 5 adults and 3 children in our party. The villa was large and roomy. The pool was great for the kids although quite deep if non swimmers. The BBQ was a great asset. Short stroll to the beach. The local supermarket was really cheap with great choice. Lovely restaurants and bars ten minutes walk by the sea. All in all really great place to stay. 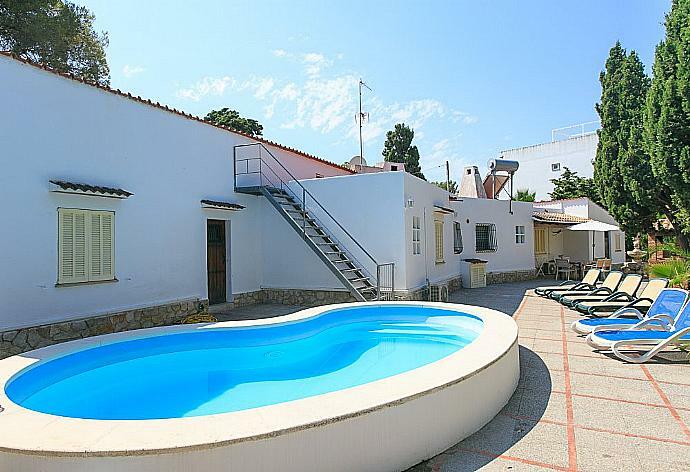 Overall the villa was nice and the location was ideal for our family with young children we had a great time. Had a great holiday thanks.Villa lovely and in a fantastic location and resort. 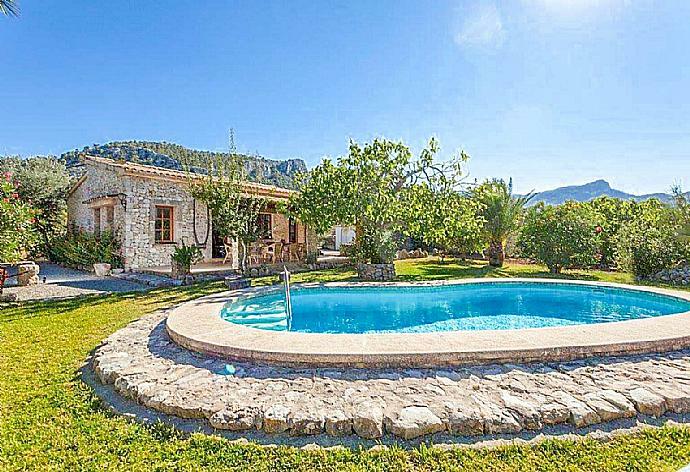 The villa is in a fantastic location, close to everything you could want. It is a very spacious, well furnished and private villa. We got slightly lost on the way to the property but the lady we spoke to in your local office was very helpful and patient with us. We had a really great holiday and would definitely recommend it to others. Fantastic location. Villa has everything you need to make it a very comfortable stay. Definitely would go back. It was our first time in Mallorca an we loved it It was a wonderful holiday and the house ist very very nice. It was a nice holiday. The holiday was very relaxing and we chose a really good location and villa. 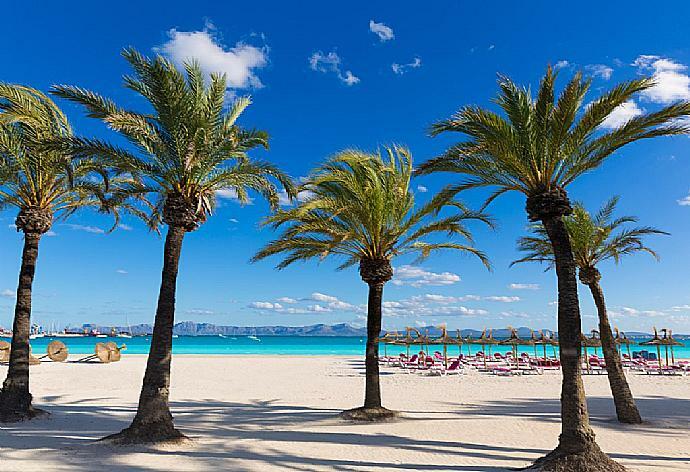 Alcudia is the capital of northern Mallorca. Famous for its beautiful medieval town built in traditional stone and perfectly preserved. The wonderful sandy beach, made of the finest white sand with shallow turquoise water, is fringed by excellent restaurants and bars. Finally, for the lovers of natural environment, the nature reserve of S'Albufeira is the ideal location for walking, cycling and bird-watching.